From Argentina and Ireland to the United States, protesters across the world have been donning a red cloak and a white bonnet. 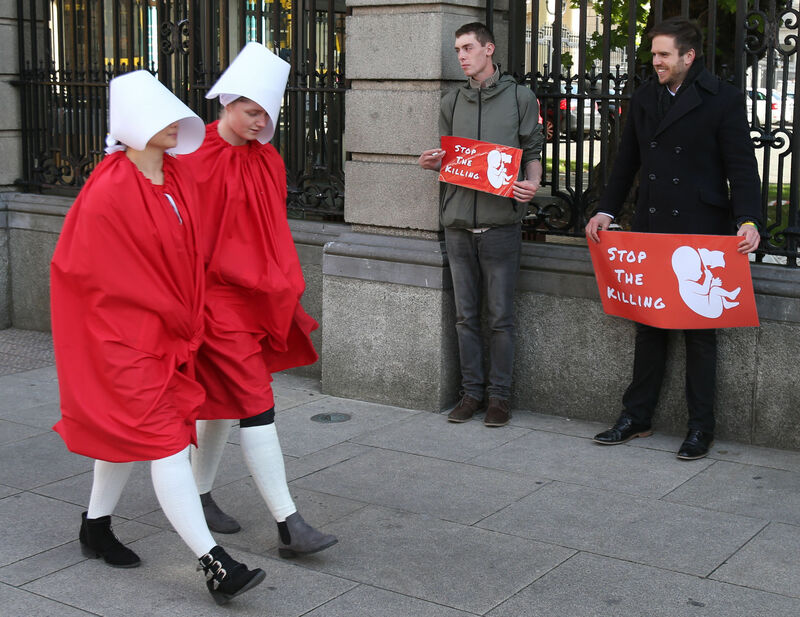 Fans of Margaret Atwood’s 1985 novel The Handmaid’s Tale, and the recent Emmy-award winning series of the same name, will recognise these protesters as handmaids. The distinctive look was visible on Tuesday at the Senate Building in Washington DC, as hearings began for Brett Kavanaugh’s bid to join the Supreme Court following his nomination by Donald Trump. The Supreme Court is the highest court in the US and Kavanaugh, 53, is a controversial nomination, particularly due to his views on abortion – last year writing a dissenting opinion that would have denied an abortion for an immigrant teenager in federal custody. It is against this factor of Kavanaugh’s appointment that women have been wearing the clothes of The Handmaid’s Tale. Atwood’s novel is set in a dystopian future where the United States has become Gilead, a totalitarian society where women are treated as property of the state and forced into sexual servitude. The harrowing subjugation depicted in The Handmaid’s Tale is now being used by women to protest against abortion laws across the world. The red cloak and white bonnet have become an international symbol for women’s rights, particularly with regards to abortion. As far back as May 2017, just a month after the release the first series of Hulu’s screen adaptation, protesters gathered in the red garb in Texas’ state Capitol to protest against anti-abortion bills. A month later, more women gathered outside the Capitol Building in Washington amidst funding cuts to Planned Parenthood, the US reproductive healthcare organisation. The symbol was also used in Ireland by members of ROSA (Reproductive rights, against Oppression, Sexism & Austerity) prior to the nation’s historic referendum vote on abortion in 2018. 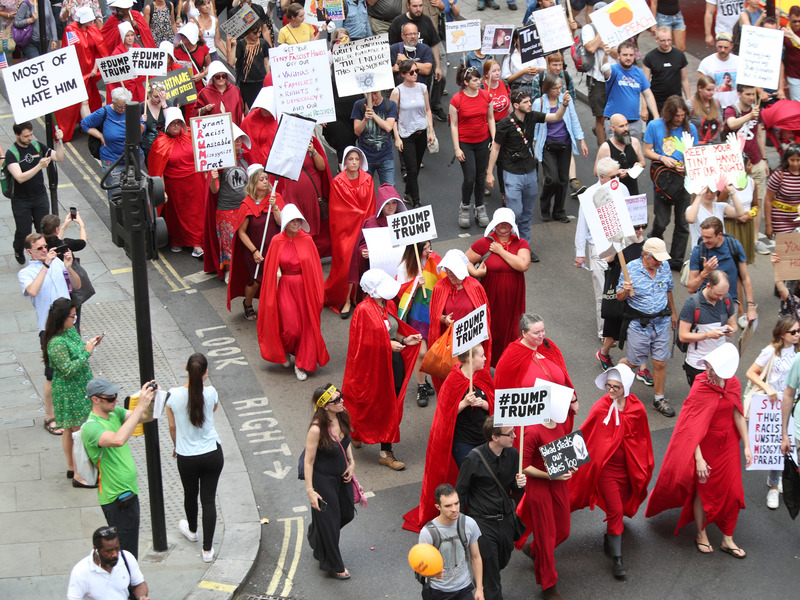 Handmaids again appeared in London in June 2018, as part of protests against Trump’s visit to the UK. Thousands of miles away, women in Buenos Aires wore the same dress in July as they called for abortion to be decriminalised in Argentina. One of the protesters even read from a letter written by Atwood herself, who supports the Argentinians’ efforts. Where will the handmaids appear next?